What do you need to CCW? The difference between NEED and WANT is that need means “required.” Wants are not required. So what do you NEED if you want to CCW? Not much, really. Gun, ammo and appropriate carrier, holster–that’s the equipment. Your state’s version of a permit. Some type of clothing that’ll cover the gun. And that’s it. That’s all you need to carry a concealed firearm. You have a right to self-defense, you have a right to use appropriate tools for self-defense—and that’s all you need. This, however, is completely separate from whether or not that will 1) help keep you and your loved ones safe, and 2) keep you out of jail or civil court due to your actions. If you want those things (or at least, a better chance of doing those two things), then you are going to want more than what you merely need. Think you already know how to use a gun? Okay—how do you know? * Have you actually rated yourself in terms of pistol skills, using common drills and metrics? How’s your safety practice? What’s your skill level on draw speed and accuracy? Think you already know how to defend yourself? How do you know? * Have you studied self-defense tactics? Gotten training in effective choices? Can you protect your loved ones in your home and outside? Do you know how to recognize incipient violence, and how to de-escalate? Do you know appropriate choices to handle violence? Where did you get that information? Have you ever had stress-based training? Scenario training, force-on-force practice? Think you know the laws regarding use of force and self-defense? How do you know? * Can you recognize lethal force situations? Can you recognize when lethal force is NOT a legal choice? Do you have other response choices available to you, or are your choices either “gun” or “nothing”? There is a lot more to carrying a concealed handgun for self-defense than simply “having a gun on you.” Sure, that’s really all you need. But it shouldn’t be all you want. *Notice how often I’m asking “how do you know?” I’ve found that many, many people who say “I’m a good shot” or “I know how to defend myself” are just guessing–they really don’t know. They’ve never gotten training in self-defense, they’ve never tested themselves objectively–they actually have NO IDEA. Luckily for them, most of them will never get attacked, especially with a lethal level of force, so they’ll never have to find out that their abilities just aren’t that good. It will mean that people around them will have to put up with them acting like skilled experts, though, even though they aren’t. Hm. I think I may need to write about this more in a later post. 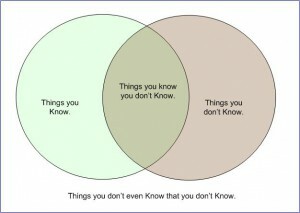 In terms of meaning, then yeah, logically you can’t know and not-know something. That probably is why this diagram is so clear to people, even though from a meaning perspective it is impossible. From an operation or status perspective, it makes perfect sense. This entry was posted in defensive tactics, logic, self-defense and tagged how do you know?, practice, self-defense by Precision Response Training. Bookmark the permalink.